In my efforts to come up with a few examples for my Valentine exchange, I found myself at my local Goodwill. I gathered a few fantastic treasures and headed to the register to pay. Then an odd and super terrific thing happened... The cashier wrapped all of the glass items I purchased in white t-shirts! What? Seriously? So much better than old newspaper! I got home, unwrapped everything, and sat staring at a pile of white t-shirts. I felt super guilty at the thought of tossing them, but what to do? Then the light bulb started glowing. I ran across a beautiful pillow last week that was covered in crocheted flowers-I wanted one badly. Two problems though, one the pillow was $70 and two, I don't crochet. I thought I had solved the problem by resolving to make the flowers from ribbon, would have worked but would require A LOT of ribbon. So what if I cut up the t-shirts instead? OH YEAH! Thank you Goodwill lady! I rinsed the strips out, gave them a twist to remove the water and threw them into the dryer. Then I started rolling, and rolling, and then rolling a little more. Once I had the flowers rolled and stuck together, I sewed them onto a pillow square. Just in case you're wondering, I used approx. 60 rosettes per side for 3 pillows, and I used 12" pillow forms. (like several hours...) than I thought they would, and I missed the link! But that's okay cause these babies rock! This is a fabulous idea! I work with at the Salvation Army Family Store and we have lots and lots of tshirts that are either torn or simply not in great shape that are ragged (bailed and sold) but this idea would save a ton of shirts from being ragged. We use newspaper now, we may switch. Thanks! Holy Moly Wendy!! You rock!!! First, paint? I would have never thought of that. Genious! these are beautiful! How lucky are you with the T shirts?? I am about to go ransack my husband's dresser for all his old tshirts and give this a try!!! thanks! Found you at tatertots and jello! That is beautiful! What a score -- free t-shirts?! That would have made my week! Saw this over at someday crafts! This is beautiful :) What a fantastic idea. I'm a new follower also! This is a most gorgeous pillow! I love it. I know it must have taken some time to make but oh, so worth it. That is such a great idea! I'm wondering what you used to secure the roses after rolling them. Thanks for sharing! I love when a plan comes together. Especially when its origins are so far from where you thought. I think thats why I create, cuz eventhough I have an idea the finished project is always so much better. This pillow is absolutely gorgeous! I just love it!! How did you get them to stay together before sewing them around or on the pillow? This is incredibly cute! My goodness! I'm featuring it on my blog! This is so amazing! Did you sew or glue the rosettes as you made them? And did you hand sew each to the square? Sorry--I'd like to make one, but I don't know if I am up to the challenge--LOL! Thanks for sharing this--it is really beautiful! Oh, I simple LOVE this pillow!! Seriously? I am starting this today! I am on a pillow rampage. Making some dropcloth pillows with stencil designs, but I needed some with texture. This will be perfect. I love them. 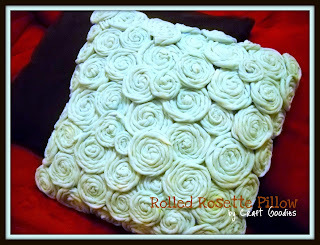 I am teaching pillows in my sewing class on friday. I can't wait to share this. beyond beautiful and the story behind them so super!!! What a great idea to use paint! I heart this pillow!! Thanks for auditioning for OMTWI!! I love this idea!!! I have a box of old T-shirts I was gonna send off to the goodwill this week, now my husband will think I'm a nut taking them back out!!! You are so clever, it makes me want to rethink things I toss!!! LOVE it!!! That is so pretty!! I love this pillow! I'm a new follower. These are beautiful! I might try this. So gorgeous! I am in awe! What an absolutely gorgeous creation! Love it and it might just be a solution for my husband's old t-shirts! Did you dye the cover of the pillow form. It looks as though when the pillowcase-like layer shows through that it is the same blue. Are my eyes and brains getting this right? If you did dye that "pillowcase" did you toss it in with the T-shirt strips? I LOVE how your pillow turned out. I found out about it through the Before and After blog. wow Wendy, what a fantastic idea! And what an amazing result - I am in awe! I LOOOOVE, Love, lOove, your work of art. I was wondering though: 1. How did you keep each individual flower from coming apart? Did you sew each one individually or glue them? 2. When sewing them onto the pillow, did you only sew them from the bottom or did you allow the stitching to pass over the top of the flowers too? Would love to hear from you if possible.